I’ve been buying one bunch of kale every week for the past month or so. And it really only gets used in one of two ways, juices and/or kale chips. Now don’t get me wrong, I love my kale juice concoctions and crispy kale chips, but the repetition does get a little boring sometimes. I was explaining my dilemma to a co-worker earlier this week, and she suggested a few new ways to use kale a bit more creatively, including a kale and scrambled egg recipe she tried a few weeks ago. That got the ball rolling in my head. When dinnertime rolled around, Vishnu and I weren’t really feeling scrambled eggs. But I couldn’t get the egg + kale combo out of my head. As I was looking through the fridge to see what else I could scrounge up, I found some pesto I made over the weekend and an unopened container of feta cheese. 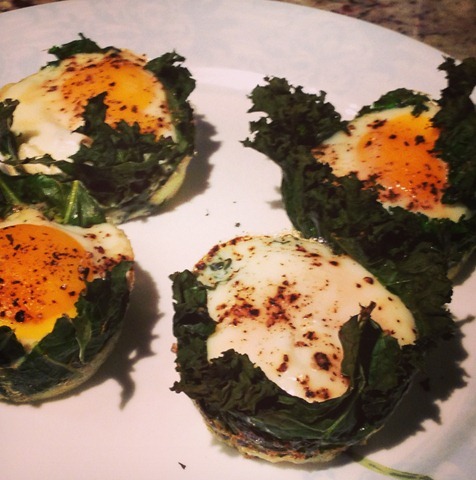 And a little while later, the baked eggs in kale cups (with pesto and feta) idea was born! This was one of the easiest things I have ever made, not to mention delicious and filling. And the best part is that the add-ins are customizable. Next time, I may venture out and make these with salsa and sharp cheddar to go alongside some beans and rice. You could go the Indian route as well. I love the flexibility! Also, I only made eight cups, but I’m assuming with a bunch of kale, you could easily make 12+. Regardless, you’ll end up with a unique and delicious meal in no time! 2. Grease muffin tins with cooking spray. 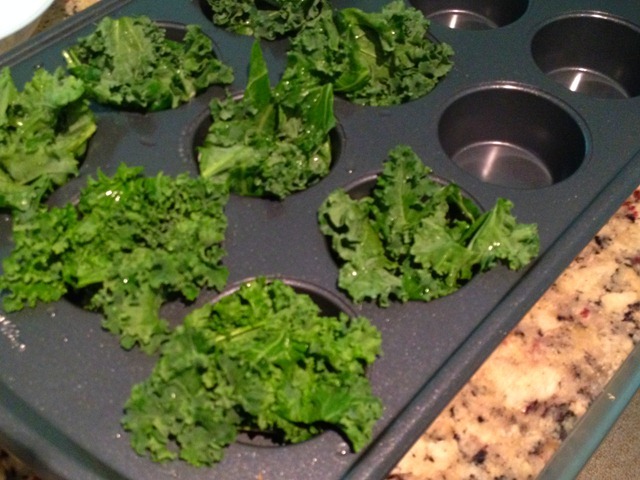 Layer a few pieces of washed kale leaves in each muffin tin. They don’t have to be perfect! In fact, make sure there are pieces sticking out. 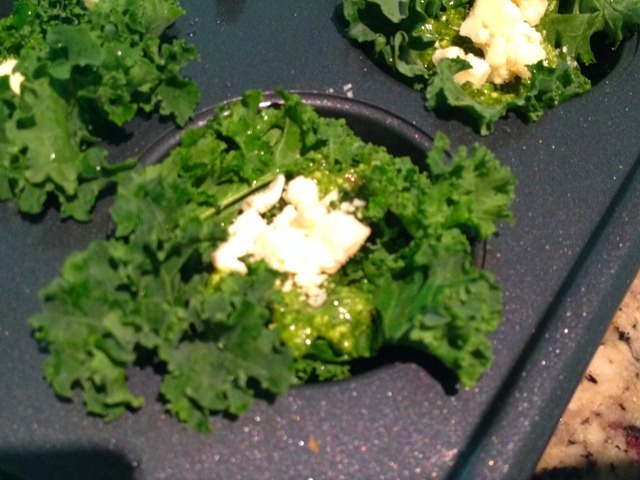 This makes it easier to remove the cups, and those exposed pieces crisp up and resemble kale chips for a nice crunch. 3. Spoon a little bit of pesto on top of each kale cup (~1 t). And on top of that, sprinkle a little bit of feta cheese (~1/2 T). 4. Crack one egg at a time into a small bowl. Carefully pour the egg into the kale cup, adjusting the kale so that the egg sits nicely on top. Season with salt + pepper. 5. Bake for 15-20 minutes until the egg whites are firm and the yolk is slightly glossy. 6. Remove from the oven and enjoy with a side dish of your choice! Are you a kale fan? What’s your favorite way to cook with kale? Yum- these look great and perfectly runny! Not the biggest kale fan but I am pretty sure these would be and exception! Have you tried baking an egg in a squash- so freakin delicious! I have to admit that I’m not the biggest fan of kale… I know it’s supposed to be an amazing superfood and all, but I think a reaaaaally bad smoothie recipe in the past totally turned me off from it — I still have nightmares and haven’t been able to get myself to try it since. THat looks delicious Parita.. 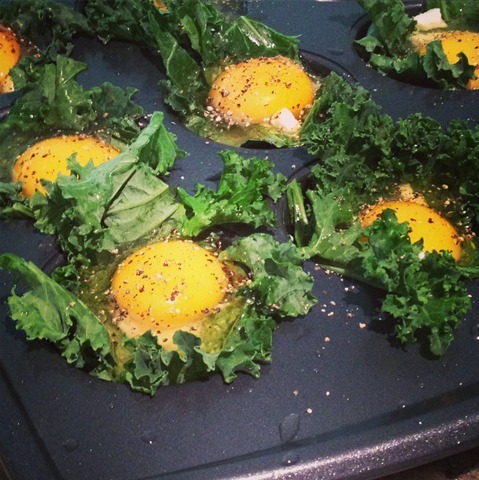 I need to buy kale, but I love the idea of eggs in a muffin pan. Very cool. Hope you guys have a great weekend.